College concluded alleged attackers' statements were credible: document shows. Eight months after a freshman athlete at Wheaton College was allegedly abducted from a dormitory - physically assaulted and threatened with sexual assault in an alleged hazing incident – administrators at the Christian school in Illinois concluded that the statements of the alleged attackers about the incident were “more credible” than those of the alleged victim, according to a confidential document obtained by ABC News. Citing the report of an outside firm hired to investigate the incident – the college faults the alleged victim for “not being forthright,” while crediting the alleged assailants for their “consistent” denials of any attempts at sexual assault and for taking steps “to ensure [the alleged victim] was not harmed,” according to a “Letter of Decision” sent by the college to the alleged victim last November. An attorney for the alleged victim - asked about the school’s letter – called it “nothing short of an attempt to sweep this incident involving football players under the rug. To conclude that these attackers were more credible than the victim is demonstrative of the way the college has handled the incident,” the attorney, Terry Ekl, told ABC News via email. The school’s letter – signed by the college’s associate director of human resources and its director of auxiliary services - focuses primarily on the allegations of sexual misconduct. It offers the first glimpse into the college’s handling of the incident, which had not been publicly reported until local police issued arrest warrants this week for five players on the school’s nationally-ranked NCAA Division III football team. James Cooksey, Kyler Kregel, Benjamin Pettway, Samuel TeBos and Noah Spielman are each facing felony charges of aggravated battery, mob action and unlawful restraint. 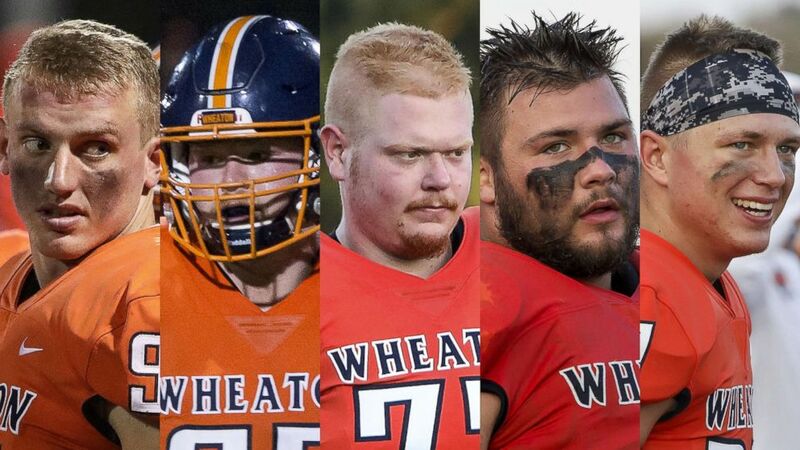 (Lou Foglia/Chicago Tribune/TNS via Newscom) Five Wheaton College football players charged with hazing; from left, James Cooksey, Kyler Kregel, Benjamin Pettway, Noah Spielman and Samuel TeBos. The accused players, all seniors, had been listed on the active roster of the team until this week. Following the announcement of the criminal charges, the college deemed them inactive for practice or competition. The alleged victim of the assault – then a 19-year-old freshman at Wheaton - claims he was taken forcefully out of the dorm room by a group of five to seven men, some of whom he recognized as his teammates, according to a preliminary investigative report on the March 2016 incident commissioned by the school and obtained by ABC News. He claims he was restrained with duct tape on his ankles and wrists, had a pillow-case placed over his head and secured with duct tape, and had his arms pulled violently behind his back, resulting in cartilage tears in both shoulders that he says required multiple surgeries. He told a school investigator last year that his attackers put him in a car, punched and slapped him, pulled down his shorts and repeatedly attempted – unsuccessfully - to sexually assault him with an object. He said he resisted, yelling “stop,” moving around, and kicking at his assailants. Ultimately, he said, the alleged assailants dumped him out of the car onto a baseball field, throwing dirt on top of him and leaving him partially naked with a pillowcase over his head. “The victim did not have an existing shoulder injury the night of the attack,” counters Ekl, who says the young man was participating in football drills and weight training around the time of the incident. He says the alleged victim had never suffered a shoulder injury prior to the attack and his entire medical file was provided to police before the criminal charges were approved. Ultimately, according to the college’s letter, the administrators concluded that no sexual misconduct had occurred. But one of the players, Noah Spielman, was found in violation of the school’s sexual harassment policy for “sexualized” comments he made while the alleged victim was “bound and blindfolded.” For that – the letter says - Spielman was given an official warning, and a note was placed in his permanent file. LaTonya Taylor, the Director of Media Relations for Wheaton College, confirmed that the Letter of Decision was provided to the victim “to summarize the official findings of the College,” but declined to provide further information, citing student privacy protections. The college released a statement earlier this week saying the school had investigated the incident and found it “entirely unacceptable and inconsistent with the values we share as human beings.” The statement said the school had taken “a range of corrective actions,” but disclosed no details. According to a report in the Chicago Tribune, several players allegedly involved in the incident were required to write an essay reflecting on their behavior and to perform 50 hours of community service. Law enforcement authorities have allowed the players to turn themselves in, citing their cooperation with the investigation. So far, Kregel and Spielman have posted bond and are due to appear in court for the first time next month. Attorneys for both men have indicated that their clients intend to plead not guilty. Mark Sutter, a lawyer for Spielman, told ABC News his client is “frustrated and saddened” by the criminal charges. UPDATE: As of Friday afternoon, Wheaton Police say all five of the accused players have turned themselves in and posted bond. Arraignments are set for Oct. 23.